"This is pretty darn close to the original classic dessert produced by the Sacher Hotel in Vienna, Austria. It is a dense, not-too-sweet, apricot and chocolate concoction. It is a lot of work but WELL worth the effort!" Beat the butter together with confectioners' sugar until creamy. Mix in the melted chocolate, then beat in the egg yolks, one at a time. In a clean bowl, beat egg whites with white sugar until stiff and glossy. Fold into chocolate mixture, then fold in cake flour, until incorporated. Pour into prepared springform pan, and smooth the top. Weird, dry. The chocolate mix did not incorperate into the egg whites. Some of my guests claimed to like it. It has potential. Super tasty and authentic! It took a LOT of work and time, but it was well worth the effort. I served it with fresh whipped cream. 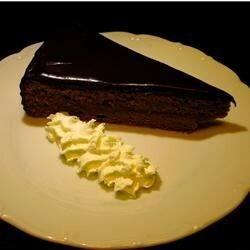 I loved everything about this Sacher Torte. (However,I would much rather fly to Vienna for the real thing!) I am going to make it for my annual "Celebrate Mozart's Birthday" dinner.